The British Wool Marketing Board (BWMB) collects wool sheared from sheep on farms across the UK, then grades and sells it on. We (Richard Sexton & Co) are members of the BWMB as wholesalers of British Wool products; such as our jumpers and knitted scarves. Recently we were driving past the door of their head office in Bradford and thought we’d pop in to get a new ‘British Sheep Breeds’ poster for our office, our last one has lasted 20 years! Not only did we get a new poster, we were given the chance to get a guided tour of their facility in Bradford and see for ourselves how British wool gets from sheep to our jumpers. “A farmer run organisation, the BWMB was established in 1950 to operate a central marketing system for UK fleece wool, with the aim of achieving the best possible net return for producers. It is the only organisation in the world that collects, grades, sells and promotes fleece wool and the only remaining agricultural commodity board in the UK. Sheep are sheared once a year, usually in warmer months. This is not painful and is required for their welfare. Each fleece is rolled up, packed with others into a big sack called a ‘wool sheet’ and delivered to the BWMB in Bradford (or other depots in the UK) for grading. On arrival in Bradford, wool sheets are hoisted up and tipped out in front of a skilled professional who ‘grades’ each one. Wool is separated into over 100 grades depending on various criteria including colour, length and strength of the staple and quality. While different sheep breeds inevitably go in different grades, some go across a few, some are mixed together, it is about the properties of the wool rather than the breed. ‘Grading’ wool on arrival is a very talented profession that requires a long apprenticeship to develop the skill to tell immediately by touch, or/and eye, which grades the 50 or so fleeces in each bag should belong to. These people are cheekily called ‘softies’ as the natural lanolin oil in the wool makes their hands soft. Whilst we were there, we watched them very quickly go through bag after bag, filling up the plastic container trucks with fleeces. Behind them full plastic container trucks were separated with lines painted on the ground, each row of trucks containing a different grade to the next. I asked what wool from the Jacob breed of sheep was graded as and was shown a pile of dark fleeces in a corner. So this is what all our Jacob British wool jumpers look like at the beginning of the process! Once graded the fleeces are compressed into large plastic bales. We saw hundreds of these bales stacked up in the BWMB warehouse. Once 24 bales of a particular grade are produced this stack is broken down so that every bale can be ‘core sampled’. The cores from the lot are then sent to an IWTO (International Wool Textile Association) approved test lab to carry out tests to international standards. The tests include yield, micron, colour and VM (vegetable matter), other tests can be made if requested. The test results are then shown against the lots for auction in the sale catalogue. This exact scientific measure of the wool’s property means wool merchants know exactly what they are buying. Gone are the days of sticking your hand in a bale and rubbing some wool between your fingers. Richard remembers the auction room at the BWMB from the days when he used to sell wool. It was a traditional auction room, very noisy, people shouting for their lbs of wool bought by the quarter pence. Inevitably technology has transformed this part of the process, with the auction room of today resembling an IT classroom. There are laptops on every desk and the process is almost entirely digital (buyers have the option to view sample bales before sale). Auctions are held throughout the year in Bradford, with bidding now in pence and half pence per kilo. And so, finally the hundreds of bales in the BWMB are sold in lots through the auction room, getting the best possible prices for UK farmers, from the cheap course wool often used for wool carpets, to the expensive soft and fine Blue Faced Leicester wool. Once bought by wool merchants this wool is then scoured, carded then spun to produce yarn. This yarn is then used by companies like us to produce jumpers, scarves and a whole range of woollen products. 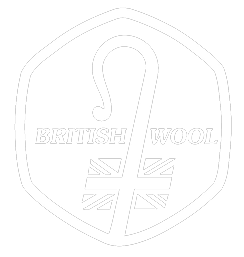 As members of the BWMB we are provided with official British Wool labels which we can use on relevant products to further promote this fantastic British material. From sheep to jumper, quite a fascinating process that we’re proud to be a big part of!